As a service plumber, one of the most common plumbing problems that I have been asked to diagnose is low “water pressure”. The reason that I put “water pressure” in quotes is because what a customer thinks is low water pressure is quite often actually low flow. There is a difference, and that difference is very important when trying to figure out the best remedy for the problem. measured (in the US) in gallons per minute (gpm). The symptoms for low pressure and low flow can sometimes look similar, but it is usually pretty easy to diagnose. 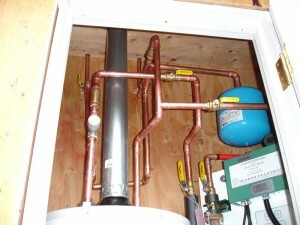 The hot and cold water in your plumbing system is under constant pressure. The ideal pressure for an average home is between 55-75 psi. If your water is supplied by a public utility company, the pressure to your home is determined by a number of factors – none of which you have control over. If you have a private water source, you have a bit more control. The first thing to do if you feel you may have pressure issues is to go to test it. 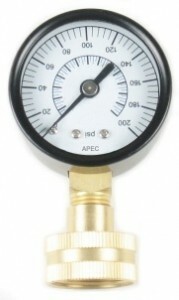 Most home improvement or plumbing supply stores have pressure gauges that you can buy for about $10 or so. Get one that will screw onto a hose bib. Screw it onto the hose bib that is closest to your water main, turn the bib on, and see what the pressure reads. If it is between 55-75psi, you don’t have a pressure problem. You should also check to see if you have a pressure regulator (PRV). They look like the picture at the top of this article. If you do not have a PRV and the pressure is too high, call a plumber and have them install one. 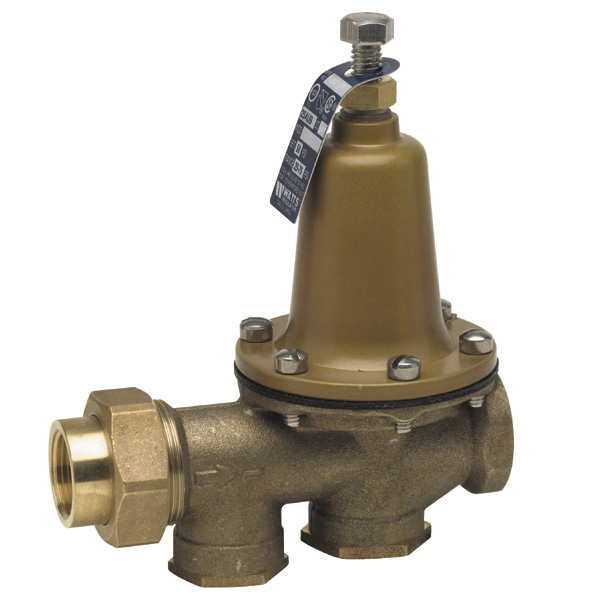 If you have a PRV and the pressure is too high, the PRV is likely bad and needs replacement. If you have a PRV and the pressure is too low, you can try to adjust the PRV. If that doesn’t work, check your neighbor’s pressure. If theirs is too low as well, it is likely not your PRV, but a problem with the municipal supply. If theirs is fine, your PRV is bad. If you don’t have a PRV and the pressure is too low, you can try checking your neighbor’s pressure, but it will likely be the same. It’s a problem with the municipal supply, and there’s not much that can usually be done. This is the category under which 75% of the problems I have seen have been. If you keep in mind the way in which plumbing is run, figuring out what the problem here is can be fairly simple. If the pressure to your home is fine, but you are not happy with the water supply to one or more fixtures, it pretty much has to be a flow problem. I drew a simple example of how the water supply plumbing is run on a typical house. Hot water is red, cold water is blue. One very common scenario is a single fixture with low flow (both hot and cold side). This is almost always due to a clogged aerator. Calcium from the water heater and/or rust from galvanized water lines or the water heater will build up in the faucet aerators and reduce the flow to that fixture. In this case, the solution is as easy as removing the aerator, cleaning it, and reinstalling. That will usually be enough to restore flow to that fixture. To remove the aerator, I recommend using small “channel lock” type pliers. Wrap the jaws with electrical tape to keep the pliers from scratching the finish. Remember “righty-tighty, lefty-loosy”. Refer to the diagram below for further info. One final point to keep in mind: An obstruction in your water supply lines will not lower your pressure; it will lower your flow. Understanding this can really help with diagnosing your plumbing issues. Do your best to try to narrow the problem down, and take care of simple things yourself. 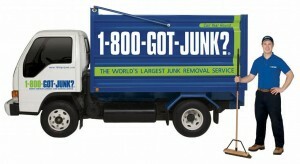 Call a plumber to fix those things that you cannot handle yourself. Either way, getting a jump start on the diagnostics can save you tons of time and money on your plumbing repairs. Steve, Nice work diseminating information. Thank you. you took to expand upon this topic so thoroughly. I look forward to future posts. I get no flow in my washer .one bathroom fixture and refrigerator ice maker . this has started since we had pipes freeze and one busted. we have well water any ideas? I apologize for not getting back to you sooner. i am not getting email notifications for new comments, for some reason. The most likely reason for what you are describing is debris in the lines, clogging up the fixtures. The only problem with that theory is that I do not know if there is no flow at all, or just no flow to the hot or cold. The ice maker line is likely blocked at the filter. The washer may be either the screens where the hoses connect to the appliance (most likely), or the lines themselves (less likely). The bathroom fixture is likely the aerator that is clogged if it is a sink, the flow restricter if it is a shower, or the fill valve if it is a toilet. Having a pipe burst and be repared has a tendency to wreak a bit of havoc on pipes, and could easily cause all or some of these issues.